Drip Trays There are 4 products. 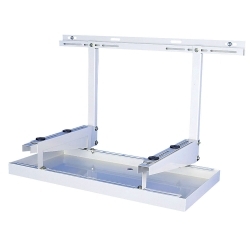 The Condensing Unit Drip Tray fits all Aspen Xtra/BBJ brackets. Available in 2 sizes. It comes flat packed with fixings included. The Plastic Condensing Unit Drip Tray fits all Aspen Xtra/BBJ brackets. Available in 2 sizes. It comes flat packed with fixings included.